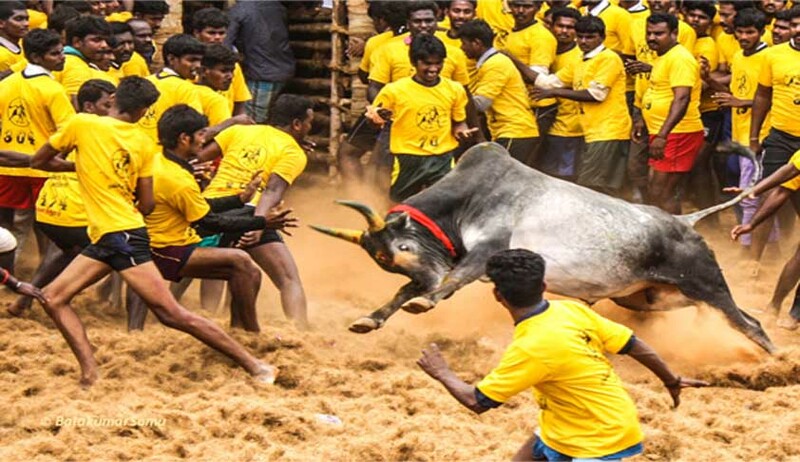 The Supreme Court on Friday referred to a constitution bench the matter pertaining to whether Tamil Nadu can conserve jallikattu as its cultural right under Article 29(1) of the Constitution which guarantees protection to cultural rights of citizens. A bench of Chief Justice Dipak Misra and Justice Rohinton Nariman felt the writ petition revolving around jallikattu involved substantial questions relating to interpretation of the Constitution and referred the matter to the constitution bench with five questions to decide on besides those raised in the writ petitions. Is the Tamil Nadu Amendment Act referable, in pith and substance, to Entry 17, List III of the Seventh Schedule to the Constitution of India, or does it further and perpetuate cruelty to animals; and can it, therefore, be said to be a measure of prevention of cruelty to animals? Is it colourable legislation which does not relate to any Entry in the State List or Entry 17 of the Concurrent List? The Tamil Nadu Amendment Act states that it is to preserve the cultural heritage of the State of Tamil Nadu. Can the impugned Tamil Nadu Amendment Act be stated to be part of the cultural heritage of 4 the people of the State of Tamil Nadu so as to receive the protection of Article 29 of the Constitution of India? iii. Is the Tamil Nadu Amendment Act, in pith and substance, to ensure the survival and well-being of the native breed of bulls? Is the Act, in pith and substance, relatable to Article 48 of the Constitution of India? Does the Tamil Nadu Amendment Act go contrary to Articles 51A(g) and 51A(h), and could it be said, therefore, to be unreasonable and violative of Articles 14 and 21 of the Constitution of India? Is the impugned Tamil Nadu Amendment Act directly contrary to the judgment in A Nagaraja and the review judgment dated 16th November, 2016, in the aforesaid case, and whether the defects pointed out in the aforesaid two judgments could be said to have been overcome by the Tamil Nadu Legislature by enacting the impugned Tamil Nadu Amendment Act?